Thanks to Roger Davy for the photo and notes. 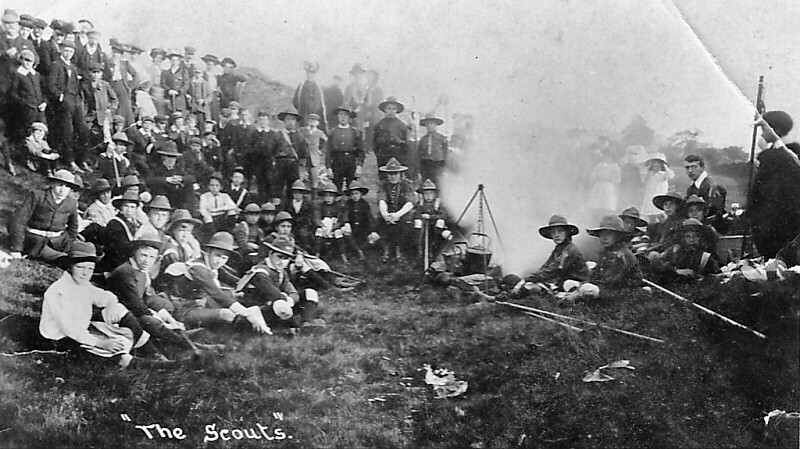 Here is an old photo of the Sutton scouts in their very early days. My father is on the photo, leaning slightly backwards on the left hand side in a light-coloured top. Dad and his friends, mostly from the Baptist church, were amongst the founding members of the movement. Initially the only uniform they had was what would become the traditional scouting hat and a wooden staff. I don't know where the photo was taken but the village seems to have turned out to join the fun around the campfire. A kettle of water was on the smoky fire to provide a cup of tea. 'Scouting for Boys' by the founder Baden Powell had been published in January 1908 and I believe the photo was probably taken in Sutton that summer. Mr Smith Clough who was a church leader founded the church group and I believe is on the photo, sitting on the mid-left of the photo, wearing his scout hat, his hands on his knees.